Kerman rugs, the most imaginative of all antique Persian urban rugs. Kerman city is the seat of Kerman province in SE Persia and is situated about 2000 feet in elevation. Weaving has been carried out continuously since about 1600 with a semi-hiatus in the later 18th century. 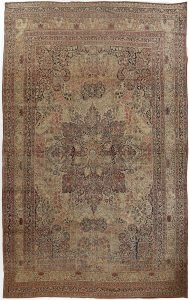 The 19th century revival was strong and the antique Persian rugs from there enjoy a considerable reputation. Ravar, among other surrounding towns, was known for particularly fine examples of rugs, usually in complex allover patterns: the “Lavar” type. 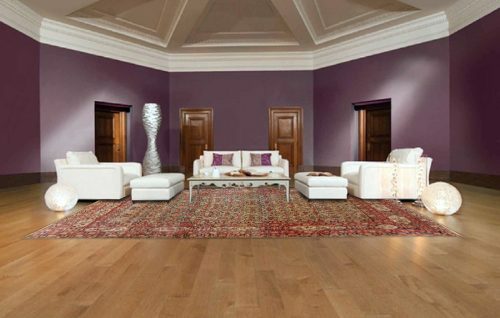 Kerman carpets are known for their wide color palettes and complex floral designs. Kermans have always been particularly popular in America. The almost French character of many Kermans makes them particularly suitable for traditional interiors. Kerman wool is the perfect carpet material, soft, silky and resilient. The flower motives are both real and fantastic, giving a garden of the imagination. 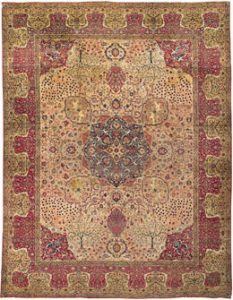 Kerman rugs are a totally unique antique Persian rug art form and they resemble no other.